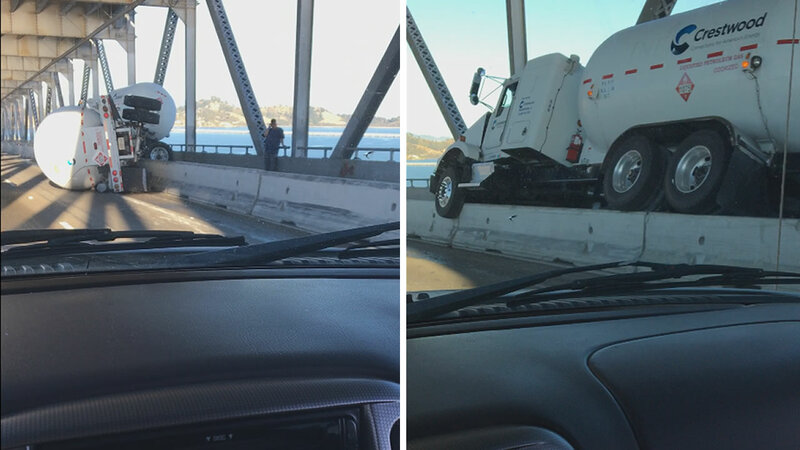 RICHMOND, Calif. (KGO) -- The California Highway Patrol issued a Sig-alert this evening after a tanker truck rolled over on eastbound Interstate Highway 580 on the Richmond-San Rafael Bridge, according to the California Highway Patrol. The crash was reported around 6:55 p.m. when a big rig with an empty tank trailer hit a concrete railing and overturned blocking the shoulder and the slow lane. A Sig-alert was issued at 7:13 p.m. The fast lane has been closing intermittently as crews work to clear the roadway, according to the CHP. As of 9:45 p.m. the slow lane was expected to remain closed for several hours.